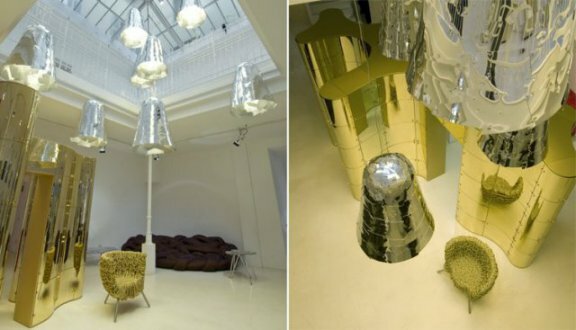 Brazilian design brothers Fernando and Humberto Campana love patchwork and layering. We've seen it in several of their chair designs. But now, the Campana studio is focusing on the patchwork and layering possibility in mirrors and they create some interesting reflections. These reflective works are all part of Edra's new 2010 Collection. In the Miraggio mirrors, the Campanas use reflective acrylic as their medium. They laser cut the mirror into puzzle-like pieces and re-assemble them, hooking them together with nylon strips. 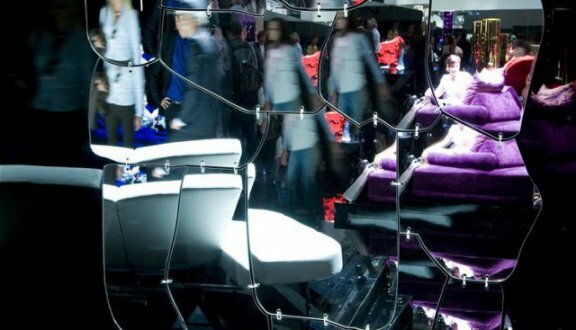 Look into the Miraggio and you get to see some pretty strange reflections. 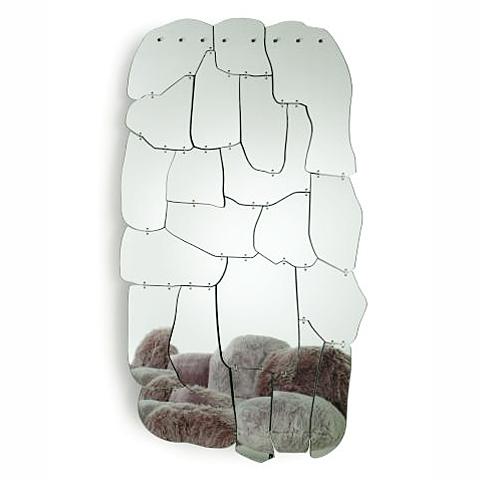 Moss is featuring the clear Miraggio wall mirror, which here seems to be reflecting parts of a Campana brothers' Banquete Chair. The tinted Miraggios also reflect a few of the Campana studio designs. 'Campana' creates interesting mirages as well. This time the brothers use anodized aluminum (100 percent recyclable) as their material of choice, as it is lighter than acrylic and easier to form into parts of the bell-shaped chandelier. On the left of the photo below, the sofa and the chair are both Campana designs. Here, the brothers use multiple layering as well as patchwork design with reflective sections made of aluminum and acrylic. 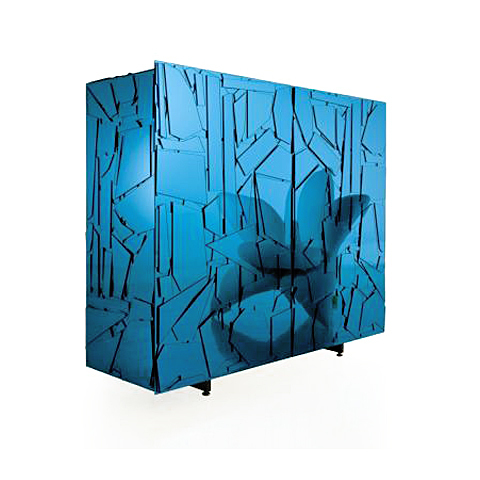 The Scrigno Cabinet can be ordered through Moss in a variety of colors. You don't want books or magazines on this coffee table, but a large piece of glassware would do brilliant things with ambient light. Moss handles this three-legged tribute to Brazilia, the capital of Brazil, which with its layered mirrored acrylic represents the layers of rocks on which Brazilia was built. 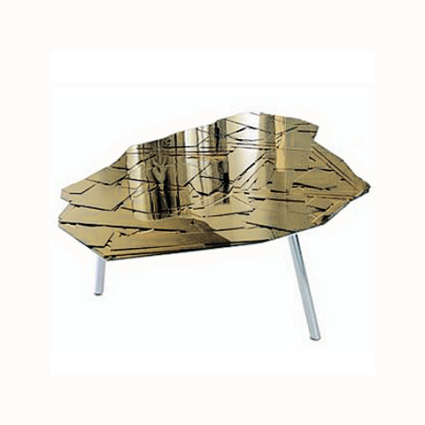 The table is available in gold, blue, green and orange. To see more of the Edra 2010 Collection, visit Edra.com. 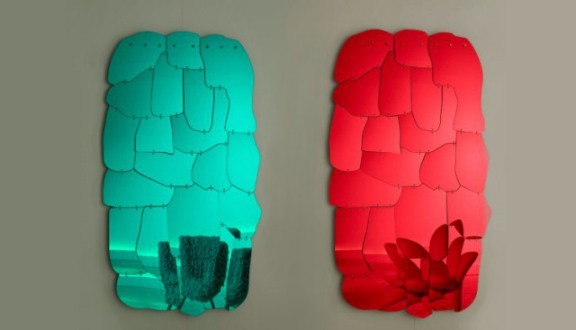 Moss carries many designs of the Campana brothers, in addition to the ones linked above. Visit the designers' website at Campana. And, if you like, visit my former blog showing some very different Campana designs.